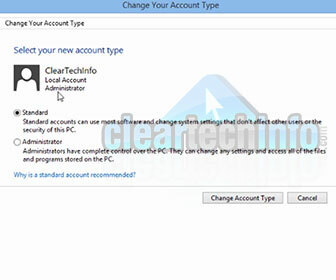 It is important to know if you are logged in as a Standard user or Administrator account in Windows 8 if you plan to make any type of system changes. If you are an Administrator, you can install and change almost any setting. In contrast, if you are a Standard user you can use most pre-installed programs and access the Internet but not much else. [adblockingdetector id=”2″]I have helped a lot of people fix problems on their Windows laptops and desktops. Most of the time when I instruct them to follow a few steps to fix an error, virus or other problem they must be logged in as an Administrator in order to complete the process. If the person I am trying to help only has access to a Standard user account then it is impossible to fix their problem. A lot of times, when I ask someone if they have Administrator access aka logged in as an “Administrator” user, they are not sure and have no idea on how to check this info. This is the primary reason I created this tutorial, to simplify this verification process. If you have any QUESTIONS or COMMENTS about checking what type of user account you are using or if you need help with other Windows 8 problems, feel free to ASK FOR HELP BELOW!